CHATTANOOGA, Tenn. (March 29, 2016) – Today officials from Nokia, the Chattanooga Convention and Visitors Bureau, the Chattanooga Airport, the Tennessee Aquarium and the Enterprise Center were on hand to introduce the first municipal demonstration of ultra-high definition live video in the country. 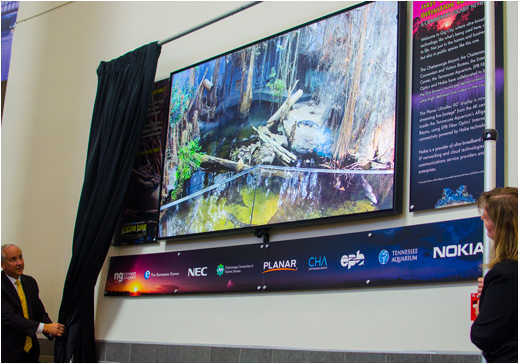 The Planar® UltraRes™ 98” 4K display screen located inside the Chattanooga Airport is now streaming live footage from cameras inside the Tennessee Aquarium’s alligator habitat using EPB Fiber Optics’ Internet connectivity powered by Nokia technology. “One of the Chattanooga Airport’s goals is to immerse visitors in the Chattanooga experience as soon as they touch down in our city. 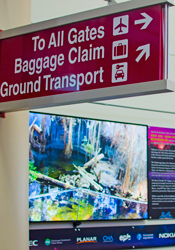 This high definition display is one of the ways to continue to show travelers why Chattanooga is internationally-recognized as a truly innovative city,” said Terry Hart, President and CEO of the Chattanooga Airport. 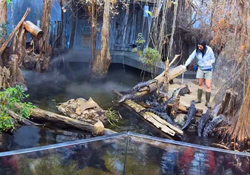 At 30 frames per second, the live video of the Alligator Bayou promises to wow airport passengers while enticing them to visit the Tennessee Aquarium and see the alligator exhibit for themselves, first hand. What is not visible to the airport passengers is the networking and technical expertise required to make the live 4k video display possible. The 4k video feed is transmitted by the EPB Fiber Optics network which is powered by fiber optic technology supplied by Nokia, a global leader in the technologies that connect people and things. “A lightning fast network is needed to support the rapidly growing Internet of Things (IoT) technologies that will make cities smarter, safer, and more enjoyable by being better connected. Alongside ng Connect members, Nokia is working with Chattanooga to deploy new IoT technology over EPB’s gigabit network that will attract local business and innovation, while also delivering new digital experiences to the city’s residents and visitors,” said Jason Collins, Vice President of IoT Market Development at Nokia and leader of the ng Connect Program and IoT Community. Screen capture footage is available here: youtu.be/BjZLsx7FEmI. Remember to check the HD settings on YouTube before playback. The Enterprise Center is establishing Chattanooga as a hub of innovation, improving people’s lives by leveraging the city’s digital technology to create, demonstrate, test, and apply solutions for the 21st century. Established as an independent board of the City of Chattanooga in 1935, EPB is a municipally-owned utility that provides electricity and fiber optic services as a means of promoting economic development and enhancing quality of life across the local area. In addition to being the first major utility to earn the USGBC’s PEER certification for having a highly automated, modernized electric power grid, EPB&apos;s fiber optic communications network delivers the world’s fastest Internet speeds (up to 10 Gigabits per second across the community-wide network). EPB serves more than 170,000 homes and businesses in a 600 square-mile area that includes greater Chattanooga, as well as parts of surrounding counties and areas of North Georgia. The ng Connect Program is dedicated to the creation of the new generation connected user experience. With its dynamic multi-industry membership, the organization drives relevance and new business models through innovation. Founded by Nokia, ng Connect is comprised of more than 250 members including leading network, consumer electronics, application and content providers. For a full list of members, please visit ngconnect.org/members and for more information on the ng Connect program, visit ngconnect.com. Follow them on Twitter @ngConnect.